Pennine have been involved with the design, manufacture and supply of high quality custom plastic extrusions for over 35 years. During this time we have gathered a vast wealth of knowledge which enables our Sales Staff to assist in the correct selection of both the specific profile required and the best grade of material to meet the demands of the Material Handling Industry in the 21st Century. We currently hold over 100 different profiles and carry large stocks of the profiles shown in our brochure, many of these profiles are available for next day delivery throughout the UK and into Mainland Europe. As a major international exporter selling to over 50 countries Worldwide, we are best placed to ship a range of extrusions by either air or sea to any part of the World. 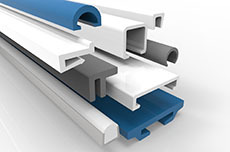 We are constantly increasing our range of standard extrusions and would be pleased to discuss any new designs or modifications to existing profiles to meet individual customer requirements. UHMW-Pe profiles have outstanding resistance to impact and have an excellent combination of both Physical and Mechanical properties which are maintained over a wide temperature range. They have excellent self lubricating properties and are highly resistant to corrosion in chemically active environments. The properties of UHMW-Pe make it the most wear resistant non metallic material available to the Material Handling Industry. All of the extruded UHMW-Pe profiles shown on our website are approved to FDA and USDA standards and are suitable for direct contact with food and pharmaceutical products. The figures below indicate the abrasive wear rate compared with other Engineering plastics.